When The Astronomer and I go out for Vietnamese food, it’s almost always bun (rice noodles) or com tam (broken rice) that graces our table. Slightly tired of our standbys, on the past few occasions we’ve ordered com gia dinh instead. 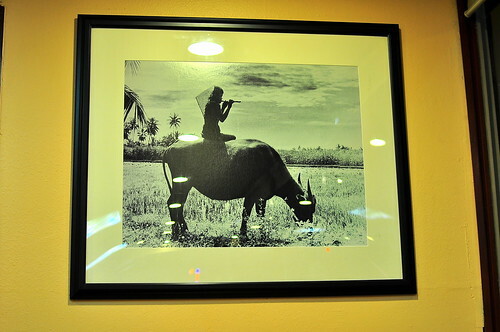 Com gia dinh is a set menu comprised of traditional dishes that Vietnamese families eat for lunch and dinner. It’s the kind of cuisine that I grew up on and find myself craving from time to time. 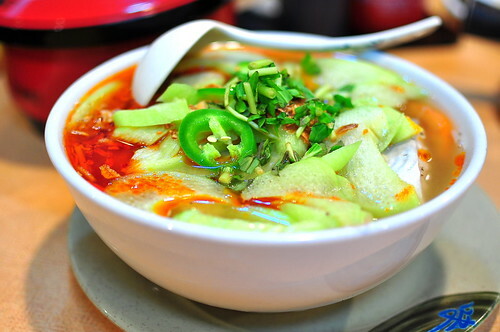 The menu usually includes a braised meat, a soup (canh), a vegetable, and lots of steamed Jasmine rice. 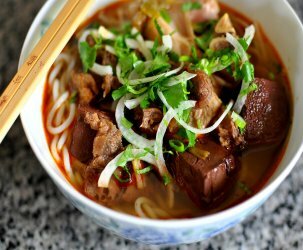 A restaurant’s version of com dia dinh is rarely as good as the real thing, but it’ll do when a sudden craving hits and grandma’s house is a hundred miles away. 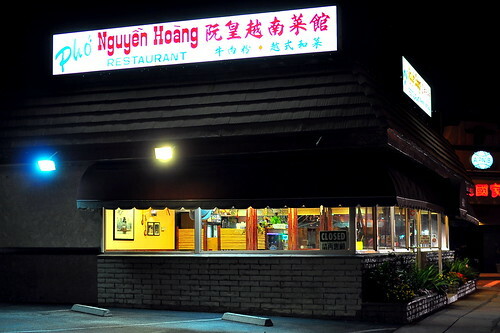 The Astronomer ate at Phở Nguyễn Hoàng in San Gabriel a few months back with a group of friends and found it solid enough to bring me in for a taste. We arrived at the restaurant on the later side of dinner and found the place still humming on a Saturday night. 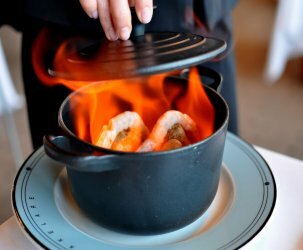 After perusing the com dia dinh offerings (located in the very back of the menu), we chose the four-course ($18) dinner for two. The three-course ($14) menu would’ve provided more than enough food for us, but we desired leftovers for the following day. 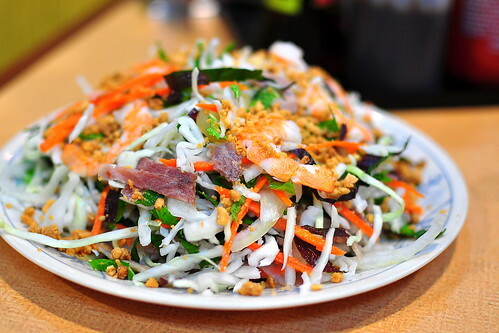 The first course was goi tom thit, a simply dressed salad with shrimp, beef, cabbage, onions, herbs, and crushed peanuts. The ingredients were very fresh, but the dressing was too mild and too lightly applied to penetrate through the mass of greenery. If it had been given adequate time to soak, mingle, and settle, the goi would’ve been much tastier. 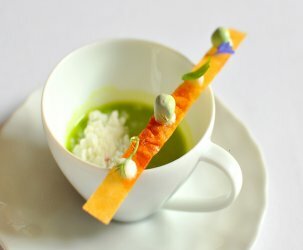 The following three courses arrived at the table at the same time, along with a large pot of steamed Jasmine rice. The canh chua ca (sweet and sour fish soup) was steaming hot and brimming with bac ha (upright elephant ears), pineapples, cilantro, and tomatoes. The Astronomer ate his canh chua over rice, while I preferred to slurp it plain. Both ways were delicious. My favorite element of the soup were the elephant ears, which were mostly tasteless, but wonderfully spongy, soaking up the tangy broth like no other. The best dish of the evening was the ca kho to, braised fish in caramel sauce. The blubbery fillets were covered in a simple, yet delectable sauce made of sugar, fish sauce, salt, and pepper. I ate at least three bowls of ca kho, making sure to spoon copious amounts of sauce onto my rice. 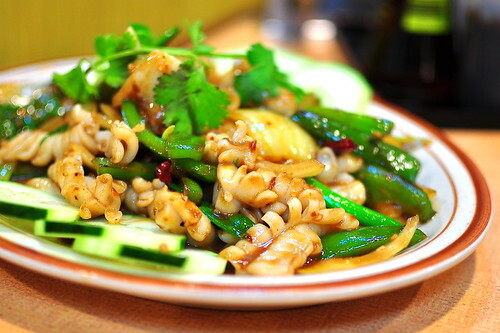 The final dish was supposed to be tom rang muoi (deep-fried seasoned shrimp), but we swapped it out for muc xao mam ruoc (squid sauteed in shrimp paste). Coming in at a 6.5 on the funky fermentation scale, the tender squid was a fine addition to our spread. The com gia dinh at Phở Nguyễn Hoàng certainly wasn’t grandma’s cooking, but I still found it appealing and comforting. After all, it is soul food. OMG, I used to eat here way back in the day with my family. The parking lot is horrendous! 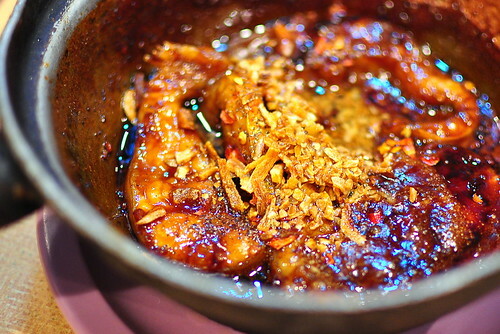 Drooling over the fish in caramel sauce, but I kinda wanna just skip it and visit Gastronomer’s Granny instead. oh man can’t beat those prices either. nice. you know, i have been trying to get more familiar with traditional asian dishes, are there any cookbooks or websites you can recommend for a beginner. I was interested in more authentic stuff. Tannia and I had lunch at this place when we were up there for your wedding. I had the Thom Rang Muoi and thought it was very OK. Not as great as Lee’s Garden. Not crunch enough, not enough garlic. Cousin – Good thing we swapped it out for the squidy! hmmm blubbery filets and funky fermentation are enough to capture my attention… I love it when you cover these VN specialties, because like Cynthia, my repertoire is limited to pho, bun and imperial rolls!